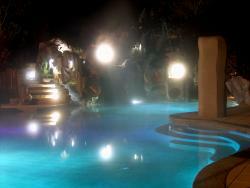 Innovative Rock & Water can take an existing Boring pool and recreate it into a beautiful oasis. 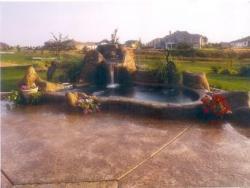 We can create waterfalls, Grottos, stone coping, new pool bottoms, you name it! This swimming pool and spa, is approximately 5 years old. It was built by an inexperienced rock and swimming pool contractor. He used inferior materials in the construction of the artificial rockwork. We removed all of the failing rock around the pool and spa, and rebuilt new rockwork, resurfaced the pool and spa bottoms, created stone steps into the pool, and made it kid friendly. There is a waterfall / jump rock that goes into the pool and a waterfall that flows into the spa. The spa can also flow into the pool creating a second waterfall into the pool. With our 3-D CAD software we will custom design your pool and landscape to show you exactly what your yard could look like. We are masters at laying out fun and easy to maintain back yards. From outdoor kitchens, and fireplaces, to custom designed outdoor entertainment centers, you can increase your families quality time together for many years to come.If you are looking to build a pool or pond, the best place is to start is with a design. A good quality design allows for you to get competitive estimates on the project you want. Our design fees are based on the complexity and size of the proposed project, but we will credit back 50% of the design fees off of the cost of the project. This is our way of building value and integrity with you our customer. Be sure to check out our designs gallery to see samples of our 3-D designs, and then multiply by 2 the quality of actually seeing for yourself the design on our computers and high quality printouts that we give you. We will also give you standard plan views, fully dimensional, for construction purposes.